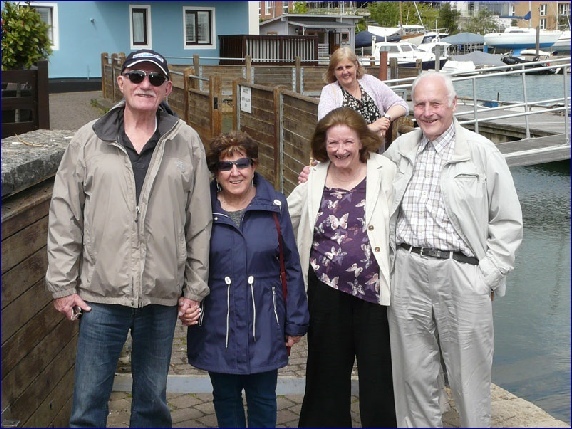 Dorothy and I spent a very pleasant few hours with Adrian and Vivian Kyte, and Vivian's sister, Simone and her husband, Tony, as Copper and Vivian were in Lymington waiting to join a cruise to Norway. I enclose a snap of us at 'The Ship'; the girl in the background probably belongs to the gent who kindly took the picture! Copper and Vivian send their best wishes to the rest of the group. In the Subject line of the email Bryan referred to it as a micro reunion which seems most apt to me so I’ve used it too.